Reading to Know Book Club - 2013! It's definitely time to start talking about the plan for next year's book club. At first I wasn't sure I'd go another year with this, but I checked in with a few people and they were quite gung-ho to go another round. This year, however, we're going to do something a little different. 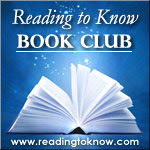 In 2013, the Reading to Know Book Club will focus on classic literature. We will alternate reading children and adult classics in a manner which will hopefully allow you to participate with your kids if you like. Or, at the very least, we hope to give everyone some breathing room and time to tackle the adult classics on the list. Q: How can you participate? A: You'll find the reading list for the the 2013 Reading to Know Bookclub below. You can read along with us on any or all of the months. I recognize that some titles might appeal to you more than others. So feel free to pick and choose which months you'd like to participate - or plan to read all of them, if you like! I'll remind you at the beginning of each month which book is being read, and there'll be a wrap-up post at the end of the month which will be posted here at Reading to Know. Read along with us, write up your own blog posts for each book you read and then you will be invited to link your post(s) which relate to the selected title of the month up at the conclusion of each month. Q: What books will we be reading and who selected them? January - (Children's) Any title of your choosing by L.M. Montgomery in conjunction with the L.M. Montgomery Reading Challenge which is also hosted here at Reading to Know. February - (Adult) The Scarlet Letter , by Nathaniel Hawthorne. Selected by Shonya at Learning How Much I Don't Know. March - (Children's) Any title of your choosing by Maud Hart Lovelace. Selected by Annette at This Simple Home. April - (Adult) No Name , by Wilkie Collins. Selected by Tim at Diary of an Autodidact. May - (Children's) Island of the Blue Dolphins , by Scott O'Dell. Selected by Amy at Hope is the Word. June - (Adult) Through Gates of Splendor , by Elizabeth Elliot (missionary classic). Selected by Barbara at Stray Thoughts. July - (Children's) The Wind in the Willows , by Kenneth Grahame, by Stephanie at Simple Things. August - (Adult) - Daniel Deronda , by George Eliot, by Heather at Do Not Let This Universe Forget You. September - (Children's) The Jungle Book , by Rudyard Kipling. Selected by Sky at Circus Caravan of My Thoughts on Things. October - (Adult) The Picture of Dorian Gray , by Oscar Wilde. Selected by Rebekah at Bekahcubed. November - (Children's) Little Women , by Louisa May Alcott. Selected by Cassandra at Adventist Homemaker. December - (Adult) A Tale of Two Cities , by Charles Dickens. Selected by Jonathan (my husband). I am very excited about this new set of books for the book club! I hope you find a month or two in which you find yourself interested to read along! Me too! Several of these look appealing. That is a fantastic lineup...I think I might have to join in this year! Great list! I wondered what you would do about the book club for 2013. I love this idea of alternating classics. YAY!! I'll just put out there that I highly recommend Emily of Deep Valley for the March selection! These titles are either ones I need to read, reread, or haven't even heard of before! SO excited! You are tempting me to guest post. I'm not seeing Mr. Diary of an Autodidact reading Maud Hart Lovelace. I want to find one of the books she wrote with Delos, though. We might each post on Tale of Two Cities. It is my favorite Dickens work. Count me in! Some of them will be rereads for me, but well worth it. Now I'll just have to start blogging more regularly! I am going to try and keep up! The book selections look great. I wasn't able to join last year but I am so excited to do so this year! Wonderful selection of books. I can't wait! I just discovered your blog and I love reading and hope to do even more than I did this past year! Saving this to check the titles and hopefully keep up with at least some of the months! I'm so excited! My little sister actually just gave me a copy of Daniel Deronda for Christmas. I was planning on just using the library, but now I don't have to. I'm all prepared. Leave it to me to be late for everything. I am involved in the LMM challenge though. I will be reading along with some of these. Some would be re-reads for me and I have too many on my plate to start that. But they are all great selections! I'd like to participate, too. I'm not yet adept at linking and the like, but am eager to learn.